No matter what machine you are using, an oil element is the heart to keep your machine lubed and working all the time. Do you use your lawn mower too often? When was the last time you sent your lawn mower for maintenance? All these questions might exhaust you but they are really imperative to answer in order to determine the healthy life of your lawn mower. Lawnmowers are machines that are made up of 95% cast iron and iron really catches rust easily. Also, the water content in the grass can make your lawn mower work slower while curtailing its efficiency. So what to do in order to curb these issues? If sending your machine for regular maintenance is not the option for you, you can consider oiling your lawn mower on a daily basis. Here is a brief glimpse of what type of lawn mower oil to use for better efficiency and long-lasting lubrication. Does brand name really matter? Are oil additives a necessity? The manual guide of your lawn mower must be loaded with a plethora of references of lubricating oils that will go best with the machine. Is this really true? The answer is no. If you are looking at something for the long run, then a brand name does not matter. You should opt for oil that is only formulated for the lawn mower and goes fine with your machine. The fact is that generic oil can be the best choice as it's fair in price and offers tremendous quality. Lawnmowers are different on the basis of their stroke engine. If your lawn mower is a two-stroke, then it's indispensable to amalgamate two-stroke oil with the gasoline as described in the manufacturer manual. Don't just pour the regular oil in your two-stroke engine as this can degrade the health of your machine and most likely, you need to call in a mechanic to repair it after the situation. Check out this article if you are looking for a lawn mower that runs on electric. Do you know what oil viscosity is? Viscosity is the property of the oil or some liquid element that decides the nature of its flow. The viscosity index of oil really matters when it comes to lubrication; also it should not evaporate easily and should be able to surpass higher temperatures. If you are using your machine regularly then, SAE-30 will be the perfect viscosity. However, if the weather is cold, then the 10W-30 viscosity index will be the best choice. 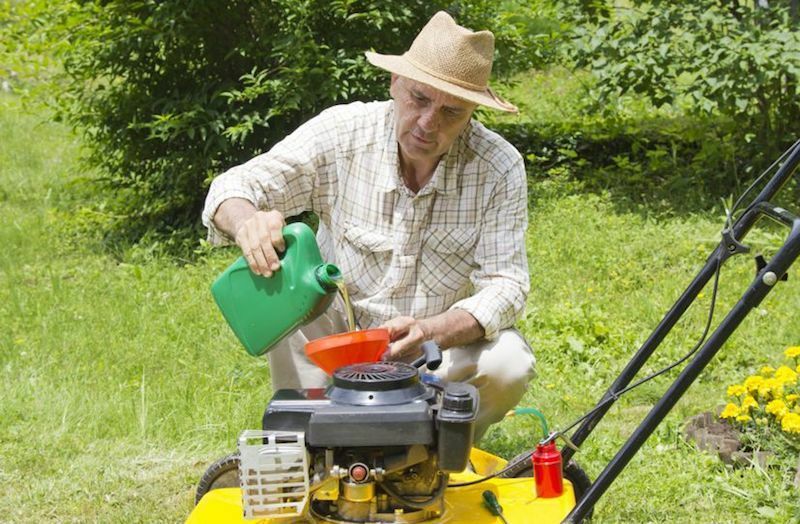 Oil additives are not a real necessity if you have a compact lawn mower. These sorts of additives are only meant for bigger machines that are designed for heavy duty works. Additives will only ruin the efficiency and will append some burden on your pocket. So go for oil that doesn’t require any additives. If you are looking for a long lasting and efficient lawn mowing experience, then oiling your equipment is vital.